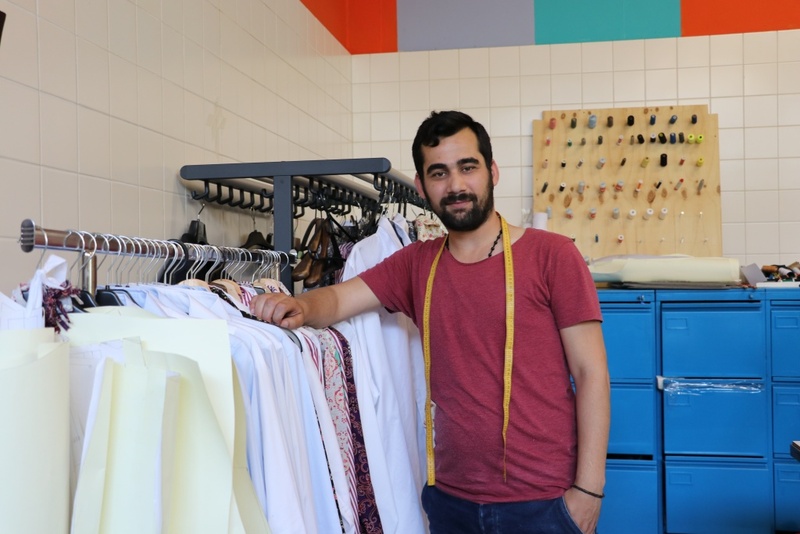 Meet Mahmoud al-Omar and Najid Khalil, two master tailors from Aleppo who are part of a new company in Amsterdam where master tailors—who also happen to be refugees from Syria—are designing and making beautiful, high-end shirts. They work at the atelier of The Refugee Company, an organization in the Netherlands that supports refugees in starting their own businesses. When I met them, al-Omar and Khalil were busily measuring and sewing beautiful high-end shirts–some that sell for over 100 Euros. 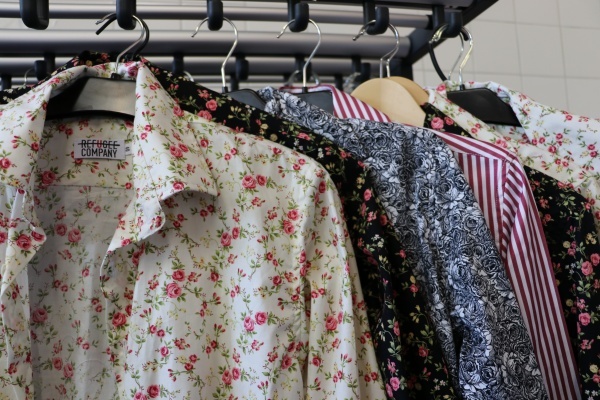 The shirts come in stripes and florals, closely fitted or loose, with carefully detailed collars and cuffs—each one as perfectly stylish as a shirt one would expect on a Wall Street executive or an elegant professional. Customers can order clothes online or come in for an appointment to be measured for a personally crafted shirt. The Refugee Company website, with its pictures of Sudanese models and Syrians wearing crisp, tailored shirts, posing alongside blonde haired and blue eyed models, uses slogans such as: Dress like a Sudanese supermodel. Dress like a cool CEO. Dress like a Persian Photographer. Their branding is clear: refugees should be recognized as an integral part of Dutch society. They are models and photographers, tailors and chefs, and many have bold lives that are something to aspire to. The tailoring company has four Syrians—three from Aleppo and one from Damascus—as well as one tailor from Iran.Najid Khalil, another tailor from Aleppo who works there, was fourteen years old when he began to apprentice as a tailor, and today has 22 years of experience in the trade. He said that handiwork was so prized in Aleppo that artisans had the same level of respect as those who studied. The Refugee Company is part of a growing movement in the Netherlands that recognizes that refugees will be integrated more quickly if their talents are recognized and utilized. The atelier is lodged inside of the unlikely space of Lola Lik, a cultural hub located inside of the former main building of the Bijlmerbajes prison in the center of Amsterdam. 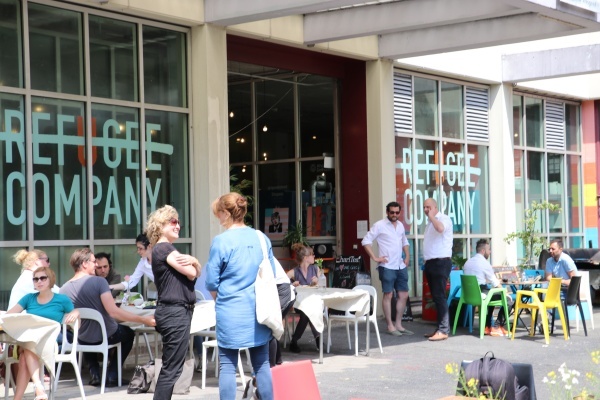 The space comes complete with a pop up refugee run restaurant called A Beautiful Mess, a shop that sells screen printed t-shirts and hoodies designed by refugees, a café, and a message board where refugees can post their expertise so that locals can call them for work. Films and cultural events are organized outdoors. Next door is the refugee centre Wenckebachweg which provides accommodation for up to 600 refugees. When I visited, the pop-up restaurant was buzzing with Dutch people on their lunch break. Hip twenty-somethings waited the tables, manned the cafes, and chatted outside in Arabic. Faris al-Qadi, a Palestinian refugee who was living in Syria when the war broke out, is now working as an events coordinator at The Refugee Company. “The main idea is to connect refugees to work, because work is the main way to integrate,” he said. For him, the ability to work as an events coordinator, utilizing his naturally outgoing nature and ability to network, is a perfect fit. “It changed my life,” he said.